Welcome again to FormForAll. This is Gay Cannon and I have been here bringing you poetry forms since we opened the doors to the pub and prior to that at One Stop Poetry. I wanted to open by letting you know that I am taking a few months sabbatical from the staff here at d’Verse Poets. As many of you know since I took this position I have lived in Port Aransas near the beach on the Gulf of Mexico. I am returning to the Dallas area in Arlington. Moving and closing on the house and getting organized and settled in the other is taking up an inordinate amount of my time right now and I don’t have as much to devote to my poetic passion. I will continue to write and read as I can and hope to return in a few months. It has been a great honor for me to have hosted this forum and I hope it has been of interest to you to explore these aspects of poetry. The complimentary aspects of poetry have also been covered in Poetics where members of our crew have done a wonderful job of talking about inspiration and viewpoints in poetry. Over the period of time I have served, we have discussed in this Forum the following forms: Karousels and Weaves; Kyrielles; Quaterns; Than Bauk; Englyns; Pantoums; Petrarchan, Elizabethan and Clarian Sonnets; Huitains; Ars Poetica; Sprung Rhythm; Triversen; Framed Couplets; Triolets; Classical Japanese and Chinese Poetry; French Ballades; Odes; Couplets; Ballads, Carols & Lullabyes; Image, Symbol & Allegory; Man’yoshu Poetry; Stacatto Poems; Etherees, Shape and Concrete Poems; Octains; Tanka; Nonets; Haiku and Senryu, Sestina; Sestina Variations; Ghazals; Rime Royal; Octets; Ottava Rima; Villanelles, Prosody and Free Verse. I have been assisted in these discussions by many fine guest hosts and Sam Peralta. Sam, who has started alternating with me has covered some of these forms in more depth and presented other forms himself. Except for the One Stop and Prosody articles, these have been archived and can be found by searching through FormForAll on this page. Today I would again like to discuss some of the poets’ “tools of the trade”. Those things that make free verse and poetic forms, well, poetic. We discussed rhyme and rhythm back at One Stop. Perhaps if you think there is a need for it, I will return to Prosody again when I return. In those articles, we talked about line length and their names – for example: trimeter (3 foot lines), tetrameter (4 foot lines) and pentameter (5 foot lines) and rhythms or meter – for example: iambic ( a single foot of two syllables where the first is unstressed and the second is stressed), anapestic (a single foot of three syllables where the first two syllables are unstressed and the last is stressed), trochaic (a single foot of two syllables where the first is stressed and the second is unstressed, and dactylic (a single foot of three syllables where the first syllable is stressed and the second and third are unstressed). These give words a musical structure. Line length and meter together roughly can be translated as the musical staff of poetry. When you want your music to sing as Shakespeare clearly did but not necessarily rhyme you can employ these devices in free verse or shorter line lengths. They work in prose and within plays to create a song when needed as well as they do in poetry. We did talk about rhyme then as well. Rhyme can enhance the musical feel and has historically been used as a mnemonic device especially when there were no written records to preserve events through communal memory. Alliteration: repetition of initial identical consonantal sounds or any vowel sounds in successive or closely associated words or syllables. The fair breeze blew, the white foam flew, the furrow followed free. “Apt alliteration’s artful aid is often an occasional ornament in prose”. Assonance – Resemblance or similarity of vowels followed by different consonants in two or more stressed syllables. Assonance differs from rime (rhyme) in that rime is a similarity in both vowel and consonant. Lake and Fake demonstrate rime and Lake and Fate demonstrate assonance. Dickinson and many poets use it as a near end-rhyme but many other poets such as Hopkins, Poe, Swinburne, and Dylan Thomas use is to great effect within the lines of the poem. It can enrich the sounds of the line giving it a kind of music even when end rime and/or meter is not employed. the linking of “begun” and “afternoon” is an example of consonance. Diction – The use of words in oral or written discourse. the use of words which are clear-cut and specific. The manner in which words are combined constitutes style rather than diction which refers only to the selection of words employed in the discourse. Formal – referring to the level of usage common in serious books and formal discourse. Informal – referring to the level of usage found in relaxed but polite conversation, among colleagues for instance. Colloquial – referring to everyday usage within a group and may include terms and constructions accepted in that group but not universally acceptable, such as certain regionalisms. Slang – referring to a group of newly coined words which are not yet acceptable for polite usage. While television, social media, texting, and other ways of communicating have altered ways we speak, it is useful to consider your tone when writing anything. It becomes jarring to begin in a formal manner and then introduce words that don’t continue in that manner such as jargon, slang, or technical words that “stop” the reader. The above levels may be slightly dated; however, it’s wise to consider that word choice doesn’t only communicate but also creates the setting and tone for your work. Denotation and Connotation – Perhaps this is a good place to talk about this aspect of word choice while talking about diction, usage and style. I am sure all of you know the definition of these words but just for the sake of review, I will define them again. I think it’s useful to consider their meanings anyway. I know at least half-a-dozen fellow poets who feel that consulting a thesaurus (and for some even a dictionary) is CHEATING! For those of us who write form poems that is unfathomable, particularly as we need them to rhyme and at the same time make sense. More importantly, we need to know the accepted place a stress falls on a word, not just the way we choose to stress it with our own regional accent, in order to employ meter. Yet there are so many more reasons to consult a dictionary and thesaurus. Many revolve around the denotation and connotation of words. Finding the right color and shading as well as the right sound of certain words transforms the poem, in my opinion. It is the difference in being “almost right” and “exactly right”. Denotation as you remember is the exact meaning of a word, independent of its emotional coloration or usage associations. Connotation is defined as the cluster of implications that words or phrases may carry with them as opposed to their denotative meanings. They may be private and personal, the result of individual experience. general or universal, held by all or most men. The scientist and the philosopher hold words to their denotative meaning, the poet relies on the connotative to carry his/her deepest meaning. Style – is a combination of two elements: the idea to be expressed and the individuality of the author. It is for the poet to come to an understanding of him/herself and the topic or material he/she wants to express. Since no two poets are alike, we can then deduce that no two styles are exactly alike. Critical analyses may lump poets in a general “style” such as abstract, impressionist, comic or vivid; however better terms used to discuss poetry would be imagery, emphasis, coherence, arrangement of ideas, structure, variety and diction. Hyperbole – A figure of speech in which conscious exaggeration is used without the intent of literal persuasion. It may be used to heighten effect or it may be used to produce comic effect. Personification as a figure of speech is also call prosopopoeia, and is somewhat related to Allegory. Simile – A figure of speech in which a similarity between two objects is directly expressed. Generally with this figure of speech, there is a comparison of two things essentially unlike, on the basis of a resemblance of one aspect that unites them. Usually and historically it has been introduced by like or as. It is no simile, however, to say “My house is like your house” although, of course, a comparison does exist. Similes can be introduced by words other than like and as. In some instances, poets use as if or than. Shakespeare employed simile both in his sonnets and in his plays. One doesn’t have to go much further than “Shall I compare thee to a summer’s day”. A rose is a rose is a rose – because the rose had become ubiquitous and overused as both metaphor and simile. The caveat with both is to make your comparisons fresh. Cliché is everywhere and it’s so easy to want to employ it. Like a carpenter always looking for new and better tools, so poets are always looking for new devices to make their poems better. These are but a few of them. However, since they may have been learned a long time ago, it may be time to take them out and sharpen them up. For today’s challenge, write a poem in your own voice, in your own comfortable style whether it be free or form and take advantage of a few of the devices described here. I haven’t written anything for a while. More stuff is getting packed and by the time you read this, that will include my computer. Take care of yourselves. I’ll see you soon! Very informative article, Gay. Best of luck in your move… can’t wait to hear all about it! meeting you in person back in London 2 years ago was wonderful and it’s just a pleasure and honor for me to be on a team with you..
all the best for the move and wow..that poetic toolbox is just wonderful…so i dived in heads-on and tried to embed as much as possible in my poem..
Good luck on the move!! Thanks for all your hard work. Your sending us off with a bang Gay! Fantastic article and best of luck with the move…I’m wondering how long you can go without us 😉 Addictive bunch! gay, we will miss you the next little bit while you move and get settled….this was a lot of fun and i tried to use a few of the devices in my piece….look forward to seeing you again soon…smiles. That is quite a tutorial. It is a bit like a larder or pantry 🙂 to dip in for ingredients. Something to study but needing time. I just wrote what was on my mind [today] and examined the ‘tools’ that had bubbled up by themselves. I sometimes wonder if ‘tinkering’ after you’ve written a poem, is a good way or not. Best wishes for your move and change of scene. What a perfect way to describe the process. I agree with Susan–this is a luscious description–a poem itself. Wonderful article, Gay. Thanks so much! I have something percolating after a brief rest – well, I”m working right now but will try to post. k.
Gay – good luck with the move – Arlington is such a wonderful area, I know you will enjoy it. Thanks for sharing your time and creativity. hey kathleen…hope you have a wonderful valentines…. Gay, I have always enjoyed your articles in this forum. This one was no exception and was filled with good information. I wish you the best on your move, and after you’re settled in I will look forward to your return! That’s one heck of an instructive article for a poet! I shall keep this as a kind of “bible” to refer to later, when I start to lose my poeming way. Thank you. You had me confused for a minute when you wrote of “diction” – until I realised that’s what we learned as “register”. Diction to this Brit means what many actors could do with lessons to improve – to stop them mumbling, dropping the voice at the end of sentences while turning away from the audience! I wish you the best of luck and bags of energy for the move, and look forward to seeing you again when you come up for air. This article is like an encyclopaedia for poets, Gay. There’s so much in it. Like Viv abouve, I was confused a little by your use of diction – unlike Viv, I don’t remember the correct British term for it. I’m not long in from a poetry class and pretty tired as it’s late here, so I’ll try and write tomorrow. look forward to it tony….i am a little envious of your poetry classes…i must say…. Classes are good Brian. Sadly, my muse has been unco-operative today. Maybe she’ll be feeling better tomorrow. Have a good weekend. This is helpful and clear, Gay. Thank you. Have a productive and rich sabbatical. Looking forward to your return. Hello Gay…this is a really fantastic post with so much great info…thankyou for all your hard work…I hope that the move goes well and that you are able to settle in the new home. Posting another in my series of Vietnam poems, inspired by Tim O’Brien’s first book “If I Die In A Combat Zone”. Gay: If there is one thing I detest, it’s moving. Sherry has this knack for “inconveniently” having to be absent every time we move. Now this was fun. I posted a poem I am still reworking (have no idea how to end it) that I wrote in May. Hope you guys enjoy! Brian–thanks for your suggestions. I think the piece works better now and seems complete. Best of luck with your move, Gay, and thanks for all the work you’ve done to inspire and inform us both at One Stop and here. Hope your time off is renewing and productive. Hi brian. Loved your response to this. Thanks again for your informative article – good luck with your move – I did come up with something rather silly. Thanks. k.
i need a picture of you with that tattoo, k…smiles. Yes! I have been a vegetarian for over 40 years. Crazy! k.
k, i turn 40 this year….smiles. What an enjoyable article, Gay. I hope your move in life is as seemless as your writing. Besides making us better writers, these tools make us better readers of literature. Instead of just thinking a piece sounds nice, we can look and see the tools used, and notice a simple poem in appearance is actually quite a work or art put together specifically. I hope I have time tonight to write something to join this prompt. I look forward to your quick return. Your inspiration has really helped to keep me grounded and encouraged. Thank you. Hope the move goes well. Thanks for all the effort you put into this. Ah, Gay, I have always enjoyed your challenges and will look forward to your return. 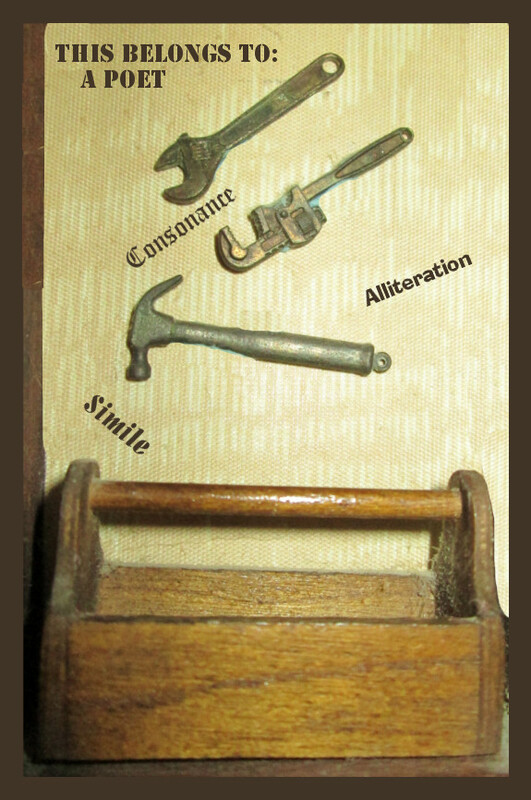 I posted an odd little poem full of alliteration, assonance, figures, meter and allegory. It came out of the sugary fog I’m in after eating lots of cake in the last three days–a mirror image of that expense and waste, I think. onsider yourself warned! Me too ; include me in as one of your admirers and thank you for your guiding hand here at dverse. i feel so fortunate to be even a small part of it and am grateful to be creating something on an almost daily basis after a long time not doing so. Have a safe move and I look forward to your return. I know I did not cover the list of suggested forms this time but practice as time goes by. Thank you. I just let this one come….I have been reading the book Empty Chairs by Stacey Danson and it put me in a darker mood….thanks for all the tools. They are truly appreciated. Gay, your post reminded me of my younger days of writing, way back in school – and of much simpler times. Another very simple poem from me, that shares my feelings in the most understated way. Tammy, I enjoyed your Kooky offering so much! Ahhh, Gay, I will miss thee! I always look forward to your posts and comments. May you move go well and may we be graced again with your presence. I met Gay Reiser on Twitter a number of years ago. She has become a great friend. We even managed a rendezvous at The British Museum one year. She is a very talented artist and poet and a marvelous teacher. I hope you enjoy this post on poetry basics as much as I did. What a wonderful post! I loved looking back at the basics. Honestly, I think I’m happiest as a student 🙂 Your reference book is my favourite, as well. I still have my well thumbed copy from college recommended by my English Professor. Wow, I had such a huge crush on him. I have such fond memories of our afternoon spent at The British Museum. I always liked thinking of you at the beach. Port Aransas is such a beautiful place. I spotted my first dolphins there on a ferry from the mainland many years ago. I hope the move to Arlington is a happy one and everything you want it to be. I look forward to connecting again when the dust settles from your move. In the meantime, congratulations and much love to you! Clearly, the bar staff have gone home but the cleaners have forgot to lock the door. Posted a poem that uses a shed-load of the tool-kit. See you on the road one day Gay! Just arriving online. Peeked in first here at the comments and for my email. I appreciate all your good wishes. I feel as though each one of you is part of my family and I am buoyed and inspired by you. The move (inasmuch as I am pretty much doing it alone) will be long and extended. The woman who has put a contract on my beach place is waiting for probate to settle and cut her a check. The probable closing date is the end of March. I am gratified this rather “stiff” article was well received. I am somewhat of an “eternal” scholar at heart and it always helps to focus me to go back to basics so I thought I would offer it this week. I have much to do but I’m eager to read the poems you’ve linked so I’ll try to get by over the next period of time to leave a comment even if I can only read two or three a day. Thank you for your response. I always learn as much from your work as I do from researching the articles. Sending my best wishes to all of you – write and stay well. Hope you feel better soon Katy…Take care. My standard for flus, chicken soup and vitamin C! oh goodness…hope you are feeling better…. Your article is great! I’m always misplacing my tools or forgetting about one and going about trying to get job done that would be much easier with the right tool. (To be honest I think my tool box is really just a bucket with a couple of blunt stones inside. I get them out and bang them together every once in a while hoping they might spark). Thanks for sharing your wisdom. Thank you for your tremendous effort. This post, as all your posts, is a wealth of information. I will bookmark this one as well. Get settled and come back. You will be missed.